She was born in Duluth, Minnesota, to a French-Canadian father and a Norwegian mother who was a Lutheran but promised to bring their two children up as Catholic. Irene was still a baby when the family moved to Yakima, Washington. She knew from her first day of school at St. Joseph Academy that she wanted to be a teacher and a Sister of Providence. After graduation, she attended Seattle University for a year and then taught second grade for a year at St. Joseph before answering the call to religious life. After professing first vows in 1943, Sister Irene taught grade school at Providence Academy in Vancouver, Washington, in Fairbanks, Alaska, and then back at St. Joseph’s. Other teaching assignments were in Sun Valley, California; Moxee City, Washington, and, her most challenging assignment, Maryville Academy in Des Plaines, Illinois, where students were ordered to attend by the courts. 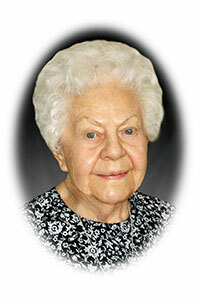 Sister Irene transitioned to payroll and office tasks at Mount St. Vincent in Seattle, and was one of the first sisters to move into the College of Sister Formation at Providence Heights, in Issaquah, Washington, where she handled the switchboard, scheduled and planned retreats and worked in the library. After earning a master’s degree at the University of Portland, she became librarian at Providence High School in Burbank, California. For 17 years she was sister-visitor and medical librarian at Providence Yakima Medical Center, in addition to visiting patients at convalescent centers. Retired now, she is a regular for SJR activities including outings, Bingo games, exercise, and opportunities to walk, read, color, play Solitaire, watch television. She recites the rosary each evening at 6:30 and watches the Catholic television station for Mass, benediction, theology and news. “I live like a queen here, no worries at all. I am very carefree and independent in many ways, I do what I want to do and can travel and take vacations, with no pressure and peaceful security.” An orphan now, she will spend this Jubilee celebrating with her religious family and hopes for an opportunity to visit New York City.